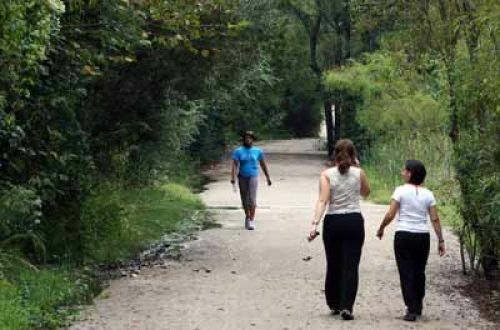 The 4.8-mile trail features a running / walking cross-country course and boardwalk winding through an open field, wetland and woodland. 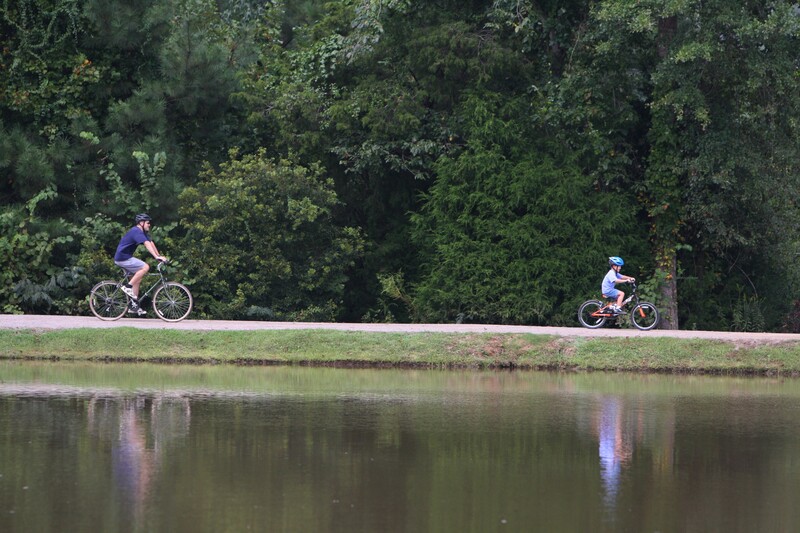 The trail directly accesses a middle school, high school, community college, two small lakes, two playgrounds and is a short drive (1 mile) from single-family neighborhoods. Location: In Hoover, AL, S of Birmingham, In Hoover, south of Birmingham, on Valleydale Road west of County Road 29. Exit I – 65 at Valleydale Road Turn east, go 6 miles and Turn left onto Jaguar Road. On Valleydale Rd. W of County Rd. 29. Veterans Park Trail (VPT) is a five-mile (8K) compacted crushed stone trail located in Veterans Park, an eighty-two acre site that is the City of Hoover's newest and largest park. 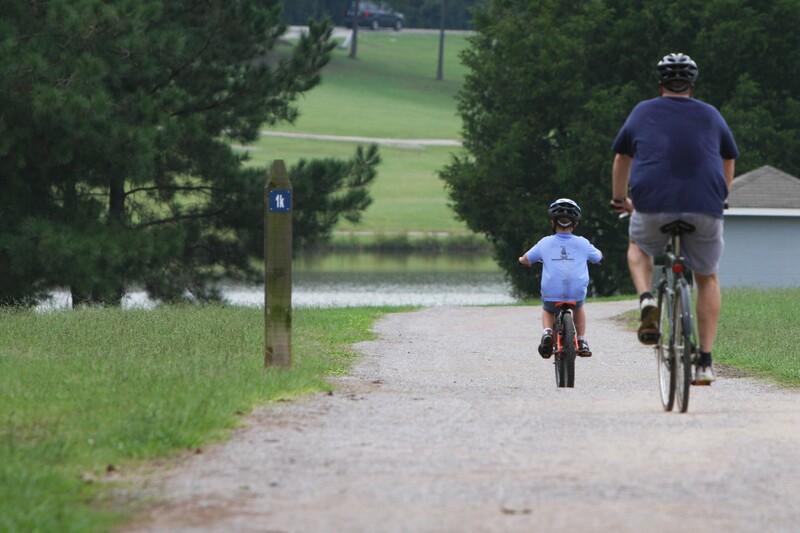 The trail, constructed and maintained by the City of Hoover (pop. approx. 70,000), is open to the public year round at no charge. VPT has many special and unique features. The multi-use nature, running, and boardwalk trail winds though diverse open fields, wetlands and forested areas. The trail provides many opportunities for individual fitness programs for all ages and is used as a cross-country running course that hosts major cross-country events in the Southeast. The trail was designed with a connector tunnel so that people can use the full length of the trail without having to cross a public road. 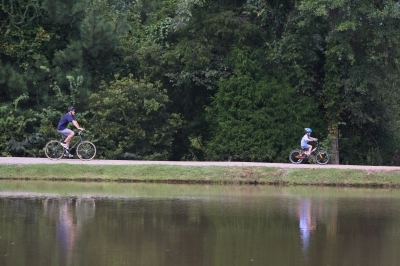 The location of the trail and its multiple uses attracts daily users and tens of thousands of visitors every year participating in various events at the park. There are many amenities along the trail such as parking, restrooms, water fountains, picnic table, trail benches, and trash receptacles with disposable pet waste bags. Recreational activities include such things as picnicking, beach volleyball, fishing, and open field play. Bikers on trail. Photo by Tommy Daniel. Bikers north of lake. Photo by Tommy Daniel. 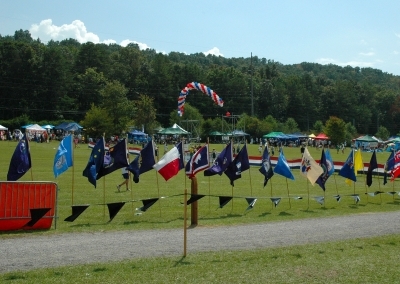 Cross County flags. Photo by Tommy Daniel.